Politically Correct Bullying, Threatening, Disruption. 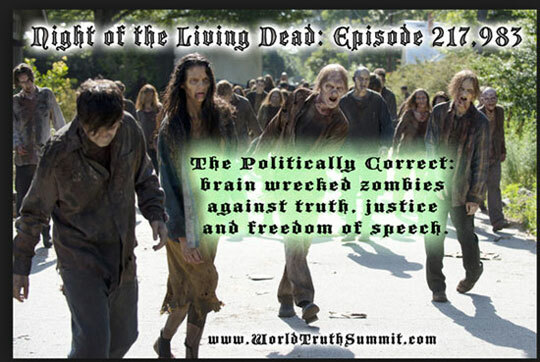 Zombies United against Truth, Justice, Freedom of Speech. Night of the Living Dead. Politically Correct Bullying, Threatening, Disruption. 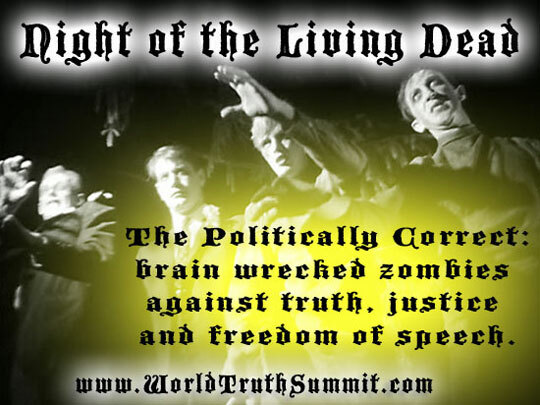 Zombies United against Truth, Justice and Freedom of Speech. Night of the Living Dead, Episode 217,983. What happened? The politically correct did it again. They threatened, bullied, and an event I was planning to attend got cancelled. The details don't matter. This happens day in and day out throughout the West. How to tell you about this? I didn't know how to start, what tone to take. Sarcastic. Derisive. I'm just going to tell you what happened, let you know about something similar that happened to Trump, add in the letter I sent to the person who cancelled the event I was planning to attend - and then, lots of images. A picture, they say, is worth a thousand words. How to stop the disrupting? That's the big question. Maybe seeing the politically correct the way the images show them will help people recoil from them. Organized disruption at a Donald Trump rally. We noticed entire sections of protesters occupying large section of the arena and also seated among Trump supporters. They were mean. Aggressive. Belligerent. Rude. Loud. They were very organized and started disrupting inside the arena before the announcement was made. When announcement was made the whole place erupted in loud screams and shouts coming from all the protesters. They were celebrating the cancellation. They didn’t stop there. They even wanted to take over the stage area with the microphone and paraded around locking arms among each other screaming at us, at all Trump supporters, hateful things. Obscenities. Vulgar gestures. They were awful. Demonic like. Many muslims, men and women. Bernie supporters all over the place. BLM as well. The whole place was swarming with them, like roaches. The arena was slowly emptied out and all the Trump supporters were out on the side walks/streets and cops everywhere trying to keep the two camps separated. The protesters were so loud. Very loud. They spilled over the streets and prevented traffic from moving from out of the parking lots and shouted and cussed at Trump supporters. These were America haters. Anarchists. Haters like I’ve never seen before. The lowest of the lowest human elements. 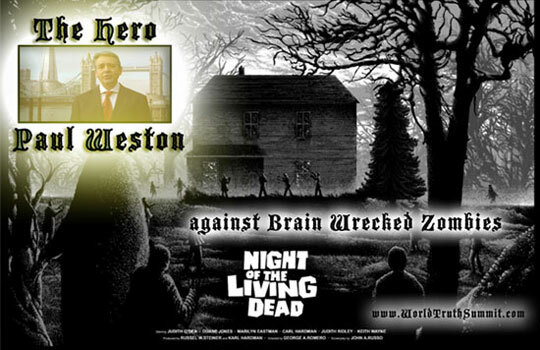 I'm not surprised you backed down and cancelled Paul Weston's speaking engagement when your venue had threatening calls. It takes courage to stand up to threats, to bullying. It is much easier to give in to unjust demands. I have an article I would like you to read - plus some information on the people who, these days, are doing a lot of threatening. Finally, I'm including a few pictures - my personal take on the people you allowed yourself to be bullied by. By the way, whom did you deny a chance to speak? Paul Weston is a soft-spoken, polite, well-mannered, and TRUTH-TELLING gentleman - entirely different from those who threatened your establishment. Memo to disruptors: an event’s audience or attendees have a constitutional right to hear a speaker. A speaker has a constitutional right to speak. These rights are not superseded by your right to disrupt. Disruptions are a violation of a fundamental right to learn, to engage in dialogue and to come together as a community. If you choose to disrupt in a way that is illegal, you can and likely will be arrested. As I am sure you know, instead of holding people accountable, you set a precedent - as does everyone who gives in to people like the Nazis, the KKK, and those who intimidated you - the so-called politically correct. What kind of people are they? Many hate our society, wish to destroy it, and are ever ready to vent their anger. They are easy to get to a rally, as the majority belong to a group like the Marxist Leninist party, or the Trotskyist party, or Revolutionary Workers. When they are summoned, many are eager to go. They do not go to listen, to discuss. They believe what they are told: that the person coming is evil, a bigoted racist extremist (etc). They actually have no accurate knowledge of the person they are protesting, as they are not listeners. They are disruptors, ragers, insulters, bullies who specialize in trying to silence opposition. They are rabidly against freedom of thought and freedom of speech. They believe the means justifies the end - and they are convinced their disrupting is for a good end: silencing all opposition to their position. It was interesting to see the difference between what I saw (and photographed), and what the mainstream media reported. Most of all, the media reported the Communists as anti-racists (and did not show their banners which read, no capitalism, no colonialism). The media also did not mention that hundreds of police officers were present to stop these people from being violent. In other words, it was considered, by the police, that the so-called anti-racists were not only ready to bully verbally, but to be physically aggressive. So I understand your backing down. But giving in to the Nazis did not work well in Nazi Germany, or outside it. Appeasing Hitler, giving in to his demands, did not work well for Chamberlain. The outcome: World War II. Finally, here is my take on the politically correct bullies. 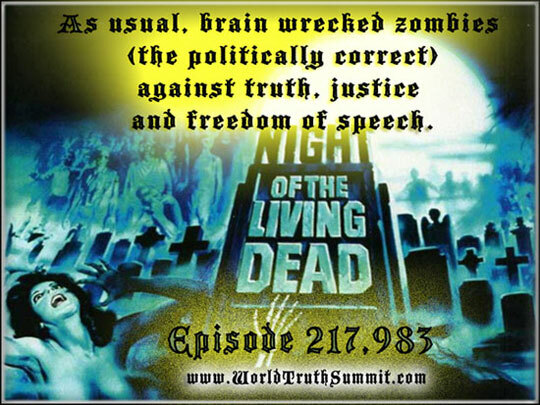 Why, you may ask, do I say this is Night of the Living Dead - Episode 217,983? Incidents like what happened at your venue take place every day, throughout the West. To number this episode 217,983 is to give it a very low number. I sent only 3 images. You're getting everything I came up with. If you like the images, please share. PS. And a thought from a friend. We all know that all kinds of conspiracy theories abound. Here was his thought on why there are so many nutty ones: The real conspiracies are why the powers came up with a mass of conspiracy theories, in order to delegitimise anyone who exposed such conspiracies. A kind of shield of lies. The "disrupters" do hate everything a free and democratic society stands for and they will not be happy until they see it all fall down. I would suggest that there is much more design in what we are seeing as the coalition of the disparate groups involved (anarchists, Muslims, Marxists, LGBT etc.) does not hang together easily and requires some sort of centralized control and leadership element. Would be nice to follow the money on this coordinated movement to determine where the nexus lies. Once identified, public pressure will come to bear in a most effective manner. Same tactics are played out here in India also.They simply bully and intimidate the naive innocent ones. In Samskrit one proverb is:Bir Vogya Basundhara.The meaning is: This Earth will be enjoyed by the brave and strong men only. Offense is the best defense. They are cowards. Secularism, democracy and constitution do not work here. You see how ISIS, with just simple tactics (Strike terror in the infidel's heart), has been able to rule Syrian and Iraq territory for so many years. You see how Pakistan (a tiny state) is winning every time by proxy war against India. You see how Islam captured the whole world just by brute force for the last 1400 years. India was and is a great country as compared to other civilizations which succumbed to total annihilation and 100% conversion. India had mighty kings and warriors who prevented the aggression and Islamic onslaught for so many centuries. That is the reason it is still the oldest civilization on the earth still persisting and not perished. Also watch the full video exposing the Kashmiri Separatist movement. As it says, "in the name of freedom of expression, terrorists and their supporters like Afzal Guru, Yakub Menon, Umar Khalid, Anirab et al are being glorified. ... But if you look at history, facts, logical analysis, then they are nothing more than a gang of hijackers, invaders, goons and dacoits. This is an aspect of the coming Hate Speech Laws in which telling the truth can be classified as illegal hate speech. It's called Speech with consequence. It used to be that if I advocated marching to a section of town and burning down the homes of black people, that would be illegal hate speech and incitement to violence. But with consequence as the Muslims are pushing for, it goes like this: Muslim groups threaten "if you insult the prophet, we will kill you." Then, if you speak out, exercising your First Amendment Constitutional rights, you are COMMITTING SPEECH THAT IS INCITEMENT TO VIOLENCE, because you were warned to keep your mouth shut by the Muslim groups! Law Enforcement, too often, sees its role as keeping the peace, as opposed to protecting our rights. Thus, Law Enforcement becomes a tool of the Muslims and their goal of repealing our Constitutional First Amendment. Thanks Elsa. 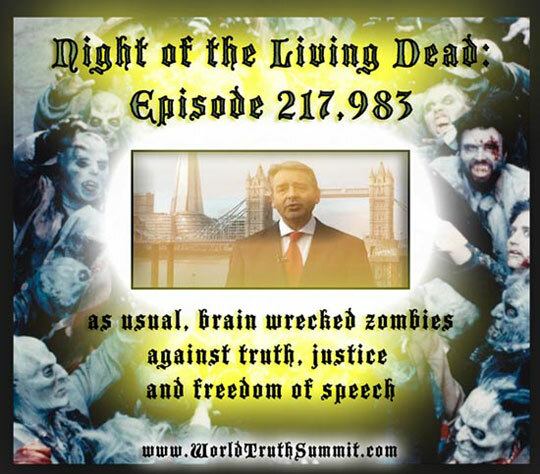 I was thinking exactly the same thing as I watched what happened to Trump and then our own experience with Paul Weston, who is indeed a gentleman in the true meaning of the word. 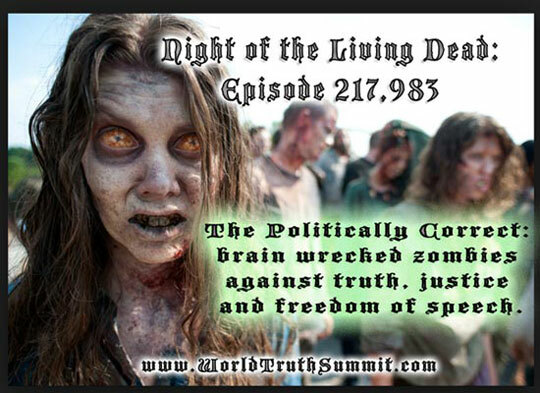 Unfortunately when I speak to friends on the Left they actually do look like zombies. They give me empty looks as though I were the crazy one. Thanks again Elsa, for the mine of information and insight. I've shared it as far as I know how and I'm sure it will go on from there. First, as you've requested, of course I've taken you're off the list. Then, hope all is well with you. If you don't mind letting me know, what made you decide to say No Thanks this time? 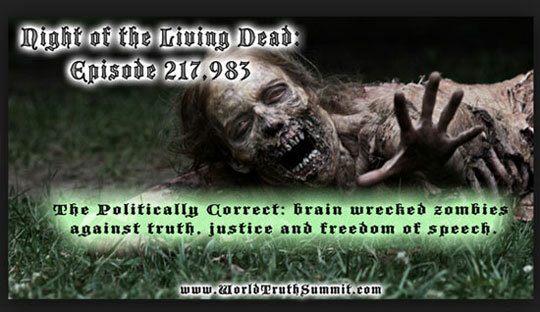 Do you disagree re the politically correct? Is it the tone? The images? Are you just swamped? Anyway, again, all the best. I applaud your work against radicalization, terrorism, etc. Truly important work! I do not agree with some of the political sentiments however (pro-Trump, anti-Trudeau with the images that go with it). I think one place where we differ is in our assessment of the danger of Islam - a force more dangerous than Nazism, in my assessment, especially in its advocating the use of deception to gain its goals. So I see Trudeau as especially dangerous in his being for importing huge numbers of people adhering to Islamic ideology - particularly when one could help 6-10 as many people if they were kept where they are. And I see Trump as the only American politician daring to speak out, to some extent at least, re Islam. "I think Islam hates us," he dared to say recently. Well, people who take the time to read the Quran know that Islam teaches that we (non-Islamics) are to be hated, deceived, destroyed. Thank goodness for non-Islamics that many Islamics don't adhere to Islamic ideology. However the ideology is still there, and many Islamics do adhere to it. Very dangerous. What's your response to people raging and ranting to stop other people from speaking? In Sweden, a filmmaker was presenting his gay-centered film. Loud and unruly Islamics went on non-stop for an hour. The security guards were ineffectual. The police were ineffectual. In the end, the event was cancelled. If anyone had tried to stop an Islamic event in a similar way, we both know the outcome would have been different. At what was supposed to be Canada's first Pegida rally, about a hundred Communists, maybe 20 Trotskyists and a few revolutionary workers were assembled an hour before, as were maybe 100 police in riot gear - to stop these people from being violent. Pegida (a much smaller number of people than those assembled against them) in the end cancelled the event. In Toronto where the Pegida group did show up, there was nasty raging against them. Trump, at the recent Chicago event, was faced with organized busloads of loud and unruly protesters disrupting the event. These disruptors are not into expressing views. They are into silencing those who disagree - often including with violence. Two years ago, at the university of Ottawa, Janice Fiamengo (professor at the university) was shut down a year ago in a similar way. That is the kind of thing that got me to my images. These are not nice reasoning people. By the way, if you were going to speak and they disagreed with you, you would have them shouting and name-calling against you. Would that be fine with you? Riot police might be needed, to protect you from them. As you can tell, it isn't fine with me. Crazy that this kind of thing is commonplace in our society. How do you evaluate the people acting against freedom of speech? Your response is very welcome.